These associations, the title of his show at Tate Modern, gives away everything you have to know before entering – or ‘engaging’ I should rather say. About 70 adults of all ages, dressed in casual clothes, sit or stand still on the ramp when the doors open in the morning. They will jointly sing, murmur and fizz for some minutes before they start moving and scatter all over the place. Sacrificing time is what you must be willing to do, if you want to gain experience in return. I’m talking about spending hours there – it’s worth it! 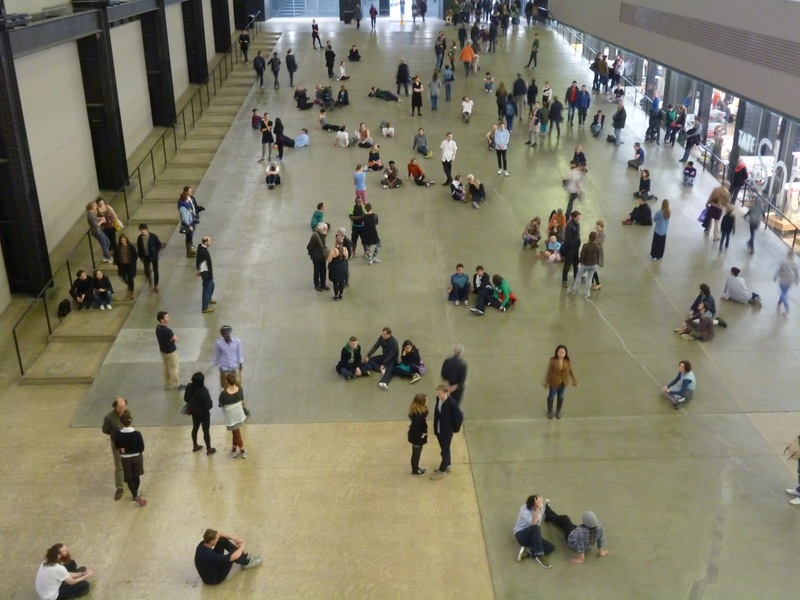 Tino Sehgal and actors in fron of the Tate Modern. CC. The recitation is one unit of a choreography that consists of several such scenes and which will repeat in turns throughout the day. 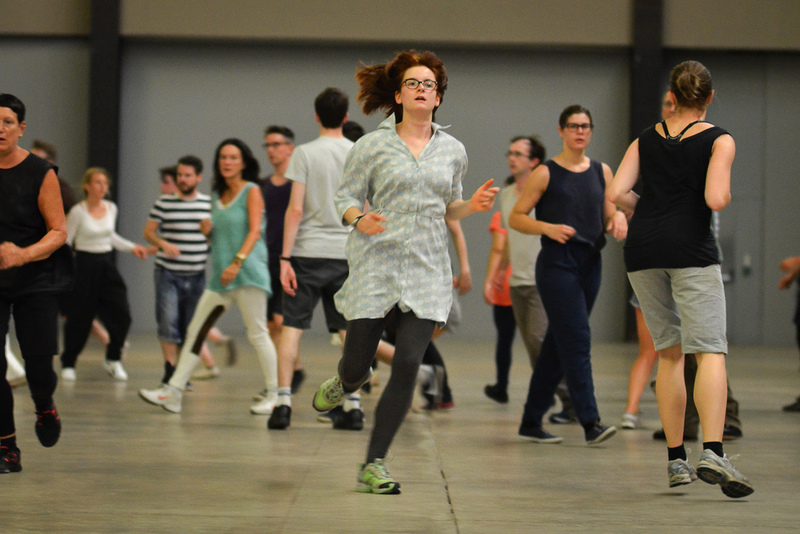 Running around in clusters without touching each other or the museum visitors is another one. Moving just ‘one step at a time’ is another regulated scenery – and you should indeed translate every move into words and take it literally as a metaphor. Movement, the body, awareness, contemplation and spirituality – ‘these associations’ were mine concerning these choreographies. And then there is the most intriguing part of the whole work: the talks. Every now and then, an interpreter will step up to you and begin to tell you a story – a (seemingly) very personal story. One man tells me about his life-threatening illness at the age of 12 and how it made him realize, he had rather not have one of his beloved be the one to fall ill. Another man tells about the difficulty of letting go in a relationship that had become stale. A woman describes to me how she experienced a new dimension of time in a car accident she once had. These associations at the Turbine Hall. CC 2011. 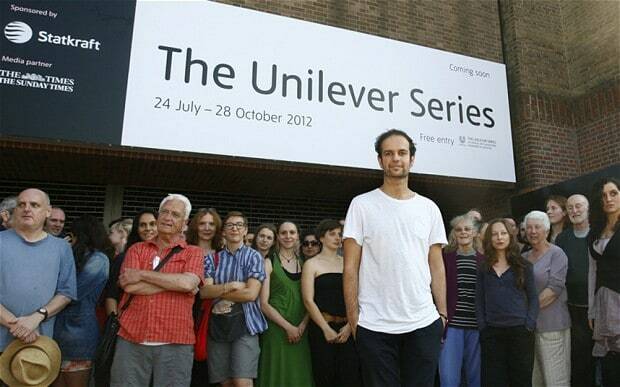 The London-born Berlin-based artist Tino Sehgal uses humans as his medium/material, in flesh and bones, movement and voice. And instead of objects, he creates choreographies. In these “constructed situations”, as Sehgal refers to his works, one can sense the trained dancer and choreographer. Interaction between audience and these “interpreters”, as Sehgal calls his fleshly object-subjects of actors, dancers and laymen, are the content of his given form and you will have to fill it with meaning. The interpreters only give you hints and ideas to trigger your associations and contemplation. These associations at the Turbine Hall. View from above. CC 2011. You have to be in the moment to experience his art. Your experience – that is where it takes place. Your memory – that is where it survives and lives on. As in life, we enter only with our bodies and we will quit with the experience and memory we acquired. This change makes all the difference between the newborn and the old man – the pre-Sehgal and post-Sehgal visitor – and no techniques of documentation and no material possession are relevant in these two ultimate states of being. Sehgal’s work in form and content seems a reflection on exactly such existential notions of the fugitive, elapsing and the connection between man and nature.